India is a land traditionally bound by story telling right from the Ramayana days. We are fond of stories and never ever get tired listening to it and reading them galore, but the foot note of those stories and learning’s are lost, but in here the author makes for an excellent story teller laced with simplicity, one on one narration and takes you to the place of happening and makes you revisit them in front of your eyes. Every story is based on real life situations of managers, of corporate heads, of sports persons from different parts of the world. Talking of sports, it automatically serves to draw a parallel of what life is all about. We are taken through some of the best stories which will lift your spirits, make you come out of your slumber and more so get your act together. The best part all the heroes in the book are close to you and me and we know them by their name except a few. The author narrates the stories personally to the reader and that makes it the best reading experience. As I found you need not be reading through from page 1 to the end, but even if you open any page you are bound to find the flow of wisdom, his care for his reader intact at every paragraph, every sentence and most important part of this book is it doesn’t make you rush. You take your time to read and digest it in your own pace. You will love it that way because there are moments you can easily look back and relate. Something like having ‘a to do’ list. The stories bring to life the traits of some of the accomplished leaders, known for their conviction, self-belief, perseverance and many other positives to make you take that first step to achieve what you thought was impossible. There are stories of Sachin to Sidhu to Micheal Phelps, all great in their own right and we would discover what it took them to be the great people are those traits of small measure in their own way making it happen for them. It would find us the most elusive success. There is one story of the Goal Keeper during a penalty shoot out. Though it has been found scientifically that a goal keeper would do better without diving in either direction, he is compelled to ‘do the diving’ to fulfill what is called as ‘atleast he tried’ syndrome. A pointer that we also take some things in life just to fulfill the societal obligations; may be we need a rethink. Some stories relate to change in strategy and some relate to a full overhaul, we need to think over before we practice them and should be read in relevant context of personal life and corporate career. The most adorable part of these stories is that its works across the ladder in a corporate and across age group in a family there’s a story for everyone. Possibly it’s never too late to start even now. 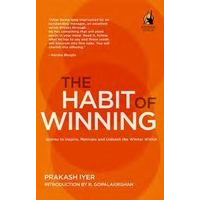 Lot of instances from everyday life and especially those from sports are a delightful read and inspire the mind and fills you with a positive spirit as much as flying a kite. I would have liked a to do list in the end of the book so that for those of us who think they need a bit of direction, or may be the author thought it fit to make the reader take the initiative. Life – It’s a mind game to be won, even before you are on the field, and sometimes the worst situations are the best platform to showcase yourself, believe in yourself and break the mental barrier as a sprinter Roger did crossing a mile under the 4 min mark, while the whole world thought it was impossible to do it. Once the mental barrier is broken, the body gives in way a little easily, otherwise it would be very tough even to take the first step. Quite often we get carried by mental convictions even before we have tried or sometimes you just don’t have the last minute of patience after all the hard work that we put it in. There are also some advices in a practical outlook like don’t ever try to befriend a scorpion lest it should sting, no fault here on the scorpion because it’s its character to do exactly that. This book would make for a nice gift to anyone who you care about and a really a special way to say you really care and this book fits it exactly. A very nice little offering and as they say good things comes in small packages! PS: Thank you Blogadda.com for this wonderful opportunity to review a nice book as I start this voyage of discovery of reading and writing reviews!